KIEV, Ukraine — A strange mist blew into one town, residents said. There and elsewhere, people noticed that metal items like children’s swings were rusting, and they felt a shortness of breath. Fields turned black. Ecologists and doctors say the culprit was a significant release of industrial pollution, but the ecological disaster, which began in August, has an added complication. The pollution has been blowing across the de facto border between Russian-controlled Crimea and mainland Ukraine, already a geopolitical flash point since Russia annexed Crimea in 2014, prompting sanctions by the United States and Europe. Authorities have evacuated about 4,000 children from towns and villages on both sides of the border and treated many for breathing ailments and allergies. Russian and Ukrainian officials have offered differing explanations for the problem, though both point to a Crimean chemical factory that makes titanium dioxide, a powder that is a precursor for paint, toothpaste and many other products. Over decades, the factory, Titan, formed a gigantic effluent pond of sulfur waste that has acidified. Russian authorities say the pond is the source, while Ukrainians point to current operations at the factory. Residents who remain in the area close their windows and stay indoors. Before the Russian annexation of Crimea, a canal diverting water from the Dnieper River in mainland Ukraine had fed the pond during dry summers. Ukraine, which along with the United States and European nations has refused to recognize the annexation, has since cut this water supply, drying up the pond, concentrating the acid and leaving a residue that is now blowing about. Residents on both sides of the border have complained of coughing, allergies and a burning sensation in the nose and throat. The Russian authorities in Crimea shut the factory a week ago, though it is unclear how this would help if the effluent reservoir is to blame. Russian officials have evacuated about 3,000 children from areas near the factory and Ukraine has evacuated about 700 children from areas on its side of the border. On Friday, the Russian regional government in Crimea declared a state of emergency in the city of Armyansk, where many people were already wearing face masks because of the sulfurous stench. 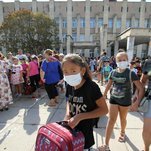 Viktor Korolenko, the head of the health care department of the Kherson region of Ukraine, which borders Crimea, said doctors are now concerned not only about the breathing complaints, but also about stomach ailments in children eating contaminated fruit and vegetables, or ingesting chemicals picked up on their hands. “The pollution fell on pears and apples,” which are harvested at this time of year, he said. The titanium dioxide plant has operated for nearly half of a century and employs about 4,000 Crimean residents. But those living on the Ukrainian side of the border now see it as a threat.